The Decimator MD-Cross V2 is an HDMI / SDI cross converter with scaling, frame rate conversion, overlays, video test pattern generator and audio tone generator. It’s commonly used after an HDMI video input source such as a laptop to facilitate long cable runs over SDI. It features 14 modes and 26 selectable output formats to pair any video input source to any output destination such as a video switcher, projector or LCD/LED display. Combining SD, HD, and 3G test pattern generation with capabilities usually reserved for a computer controlled scaler/converter the DECIMATOR MD-Cross V2 Miniature HDMI/SDI Cross Converter is a small independent device that features the same proven cross converter found in DECIMATOR's larger MD-DUCC. The DD-Cross features both an HDMI and a 3G-SDI input, and can cross convert either signal to the other. It features a built-in scaler and frame rate converter as well, allowing you to convert the input signal to your required output standard. The included test pattern generator of the MD-Cross supports 26 selectable output formats with 54 test patterns. It features one HDMI output, one loop through SDI output, and two pairs of 3G-SDI outputs, controllable via fourteen selectable conversion modes, providing you with a variety of modes to fit your needs. This converter does not require a computer or DIP switches to control as it incorporates a small LCD screen for menu functions, and four buttons for control. It comes with a power supply with locking power cable to prevent accidental power loss during use. Note: Firmware Release 2.0.6 adds 3G-SDI Level B support for 1080p60/59.94/50 for this model, as well as the ability to set the SDI output to 3G level A or B and convert between A and B. It also enables horizontal and vertical image flipping via the built-in scaler. The HDMI or SDI input can be scaled and/or frame rate converted to the required standard. 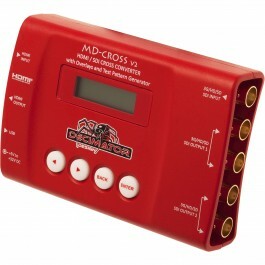 The MD-Cross incorporates an LCD and button control system. This gives you access to features that have usually require a computer. Adjusting DIP switches or having access to a computer to change a simple setting are no needed with the MD-Cross. The unit features adjustable Title Safe, Action Safe, and static center cross overlays. The unit also supports text overlays. The unit supports 54 test patterns, including Luma and Chroma Zone-plates. The unit supports 16 channels of audio level metering overlays. The unit incorporates a USB port for control and firmware updates.